Coworking is more than meets the eye. At first glance, and even by the name, it seems like one giant table with everyone working together. While we certainly encourage that and find that many coworkers seek out this kind of space, we know that it isn’t always what freelance or remote workers, small teams, or others are looking for. That’s why we offer an array of rooms, offices, and spaces, ready for your use 24 hours a day! We have offices available for rent on a first come, first serve basis. Right now, our private offices are FULL! This is exciting for us, but we realize an office may be what you’re looking for. We invite you to still consider a membership and try out the rest of the space—we’re also working on Launch 2.0 which will provide more private office space! Email shelley@launchterrehaute.com with any questions. 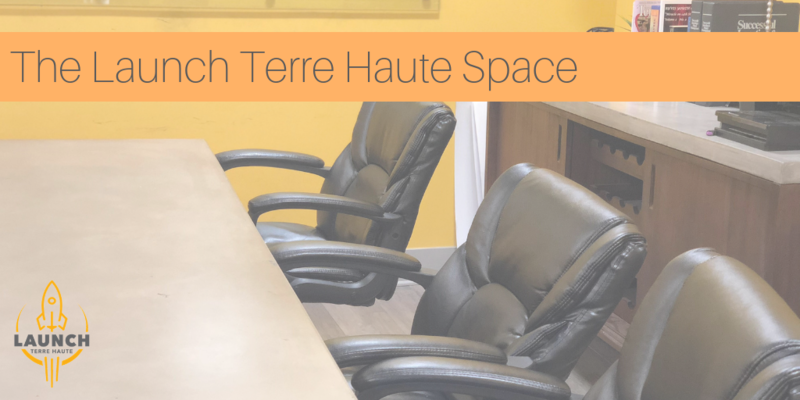 We have a very cool conference room inside Launch Terre Haute that is open for members to use. As a member, you can reserve the conference room for video calls, team meetings, or events. With a large conference table, glass whiteboard, and sliding doors, this room is the perfect space for all of your meeting needs. Whenever the room isn’t in use or reserved, members are welcome to spend the day in the space and use it as their working area. In addition, Launch also has access to the Deming’s lobby conference rooms. If you’re looking for something more secluded, these rooms are perfect! In the main room at Launch Terre Haute, we have two reclining chairs, a high table, small tables, comfy chairs, and bike desks. In addition, we have a bar that sits next to our kitchen area—microwave, refrigerator, sink, coffee maker, and more to ensure that you can bring snacks, lunch, or any kind of sustenance to “work.” These are our most popular work areas and really encourage the “coworking” vibe. It’s in these areas that our members collaborate, interact, share meals together, and ask questions. It’s an open and flowing area that encourages teamwork. We’re open and available to you 24 hours a day, 7 days a week! A Launch membership comes with a key that allows you access to the space whenever you’d like. As remote workers, we understand that some folks work better in the evenings, and some projects require all-nighters. Whatever work schedule works for you, Launch allows it. Coworking is open for interpretation, especially if your desires for what your workspace looks like changes on a daily basis! We put a ton of thought and dedication into creating a place that works for all types of workers and we hope you’ll take advantage of it. As always, if you have any questions, feel free to contact us! We’ll see you at Launch!